Ideal for reading books, directories, menus, maps, stamps and more! Quit worrying about low light and fine print and enter into a world where literally nothing can inhibit your vivacious reading habit. Presenting the Jumbo Magnifying Glass w/ LED Light. 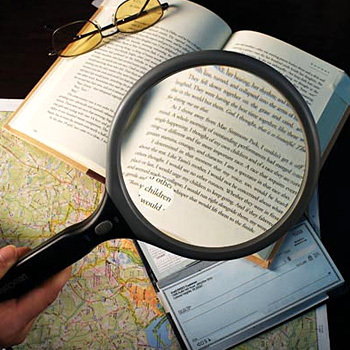 You now get a chance to go retro and use this old fashioned magnifying glass once again. There’s a reason why we call it jumbo – because unlike other magnifying glasses, this one has a colossal diameter of 13 cm which makes sure you don’t have to keep moving it around your page too much. Aided with 2x magnification with 6x bifocal spot lens and the power of illuminating LEDs, there’s an outside chance that you might even be able to spot some bacteria on your pages. On a serious note though, the Jumbo Magnifying Glass w/ LED Light guarantees comfortable reading even in low light and extremely small print. It’s easily portable and you can carry it around in just about anything – your handbag, backpack or briefcase. The Jumbo Magnifying Glass w/ LED Light is a very thoughtful gift idea for your ageing mum or dad or friends who read a lot. You could even order one for yourself online, you never know when you might need one. Product dimensions: 0.02 (H) x 19.5 (W) x 33 (D) cm / 0.007 (H) x 7.6 (W) x 12.9 (D) inches.